Vintage Tropical in a Mid Century? You bet! I have been collecting vintage tropical items for a few years. I especially love mid century pottery in all those luscious colors. And the offerings of bark cloth fabric are endless. It was such a durable fabric that all those drapes and curtains from years ago are still around and looking as great as ever. Incorporating this into a 1951 house was gonna be fun! The small 3/4 bath off of the kitchen retains it original chrome edged sink and toilet. They are Univeral Rundle brand and from my research I think the color is “Verdant Green”. It is a medium minty green. This bath has the same newer black and white tiled floor as my kitchen so I also have to work with that for now. 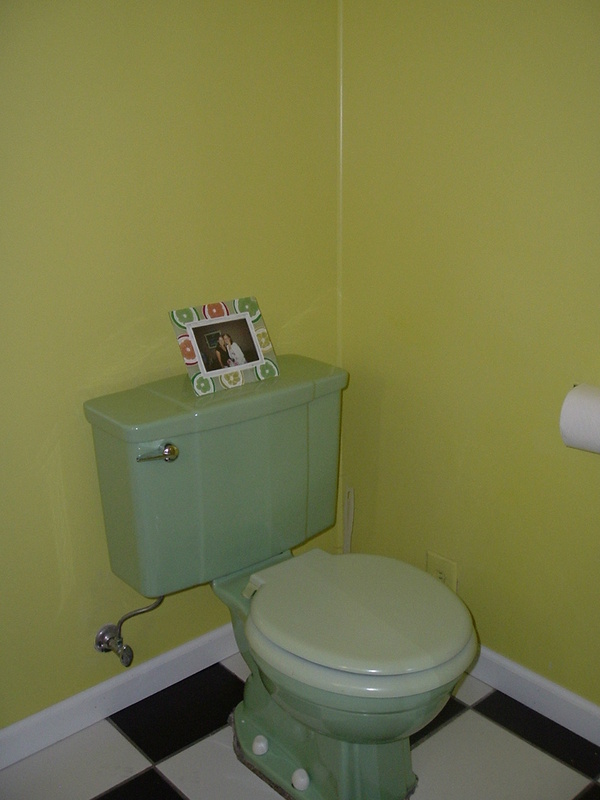 Unfortunately the walls were painted a nauseating chartreuse that clashed with the green. That had to go. The grey color we painted the walls is from the Sherwin Williams Suburban Modern Collection. The trim and vanity were painted a bright white. I purchased chrome NOS round back plates from Ebay and dish style knobs from my local Ace Hardware. The window valance is also an Ebay find. It is a piece of tropical bark cloth in pale grey, burgundy, green and yellow. All I had to do was attach it to the clips on the curtain rod. 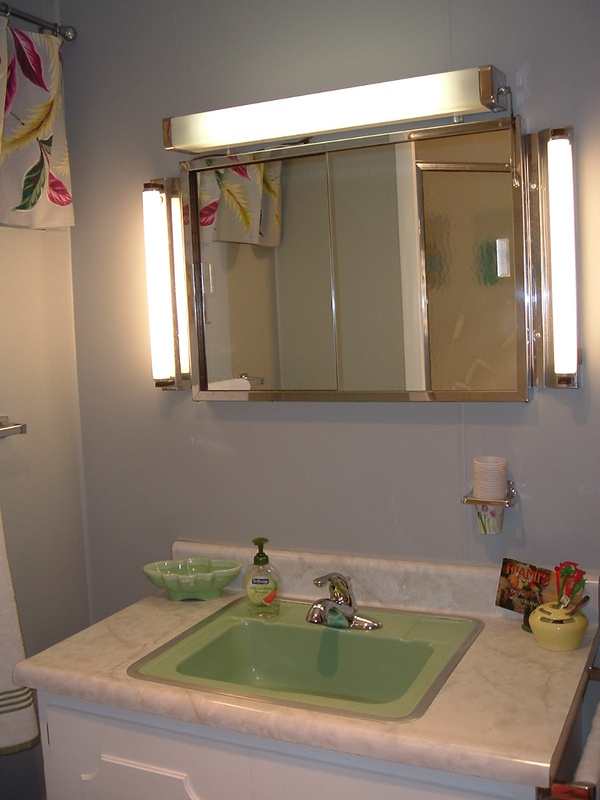 Hubby removed the original chrome medicine cabinet/mirror/lighting and cleaned and polished it. It is not perfect but works just fine. We replaced the switch plate covers with some vintage ones I got on Ebay in chrome. We also added simple towel bars that are similar to what would have been here originally. 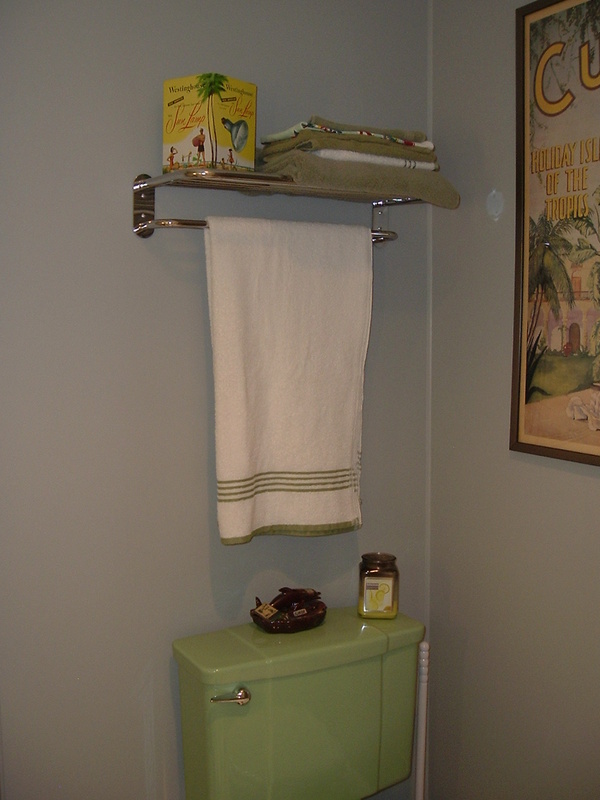 Over the toilet we added a chrome shelf/towel hanger for more storage. The original (and very disgusting) sink faucet was replaced with a simple chrome one from Lowes. The shower door had been covered with a mirror so Hubby removed it to find an etched swan motif; perfect for our tropical look! The shower had been recently tiled in white 4″ by 4″ squares and had new faucets; that was all fine. My accessories were picked up here and there for very little. 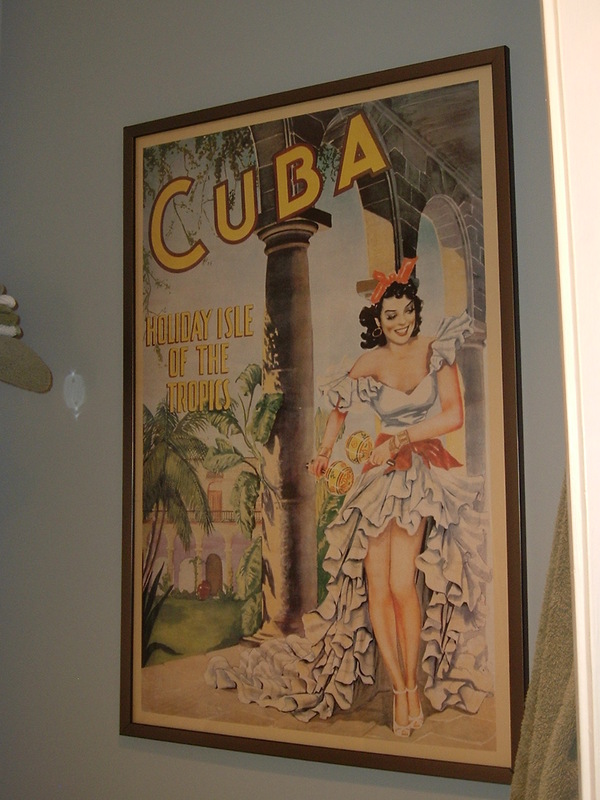 The reproduction Cuba poster was from Big Lots for $4. I finished off with old Miami travel postcards, a 1960’s sunlamp (still in the box with great graphics) and some vintage Florida souvenirs from garage sales. I spray painted a vintage swan towel holder green that matched the sink and toilet. I finished off with grey and green striped towels. When the kitchen gets gutted, this space will probably get a serious overhaul; until then, I don’ t think it looks too bad. Our plan for the large kitchen was a gut job: New cabinets, flooring, lighting, counter tops, back splash, even moving the washer/dryer back to their original place in the main bath. Just one thing stopped us from breaking out the sledge hammers: Hubby lost his job (of 23 years) 8 weeks after moving in. So….on to plan B. We have to work with what is here and have virtually no budget. Never mind that the upper cabinets are so small that I cannot stand up a box of pasta or a vinager bottle. Or the fact that the last owners were too lazy to remove the under-cabinet mount stereo, recipe box or paper towel holder and just tiled the backspash around them! They never used painters tape or a drop cloth any where in the house. The grout on the floor and back splash were never sealed. There are paint splatters on the grout and the cabinets that will not come off. The dishwasher did not work so we scrapped it and were left with a big hole in the cabinets. Sounds great huh? After a thorough cleaning (not for the faint of heart), we were ready to think about what we could do. 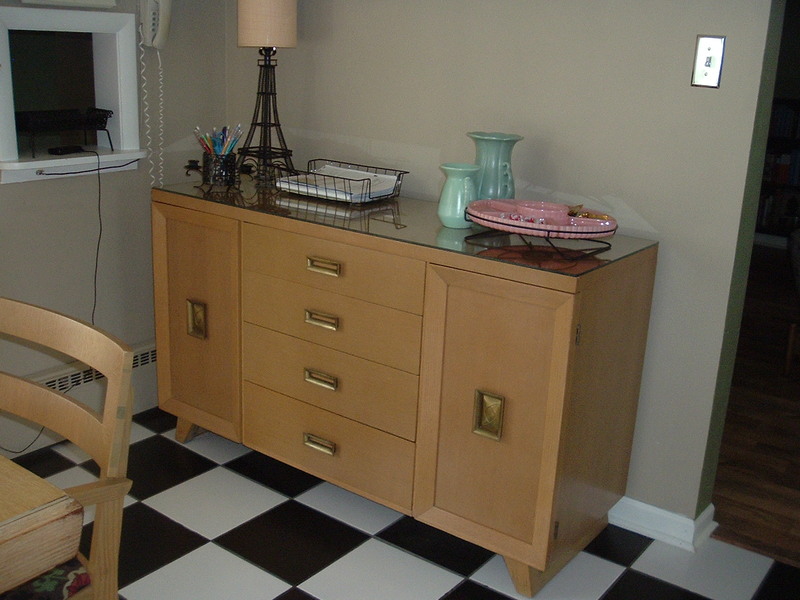 The walls are a medium taupe color and the cabinets painted black. The floor is 12″ by 12″ black and white ceramic tile. The back splash is square taupe tiles. The counter top is black and taupe laminate. I can live with it all for now, but not in the Tuscan style they were trying to create. We removed the brushed nickel bin type pulls and knobs on the cabinets. We could then see the ghost marks of round back plates on the cabinets. I purchased NOS ones in chrome on Ebay. My local Ace Hardware still carries chrome convex style round knobs (I think they are called “dish” style) and simple pulls that were used in the 60’s so those completed the hardware. 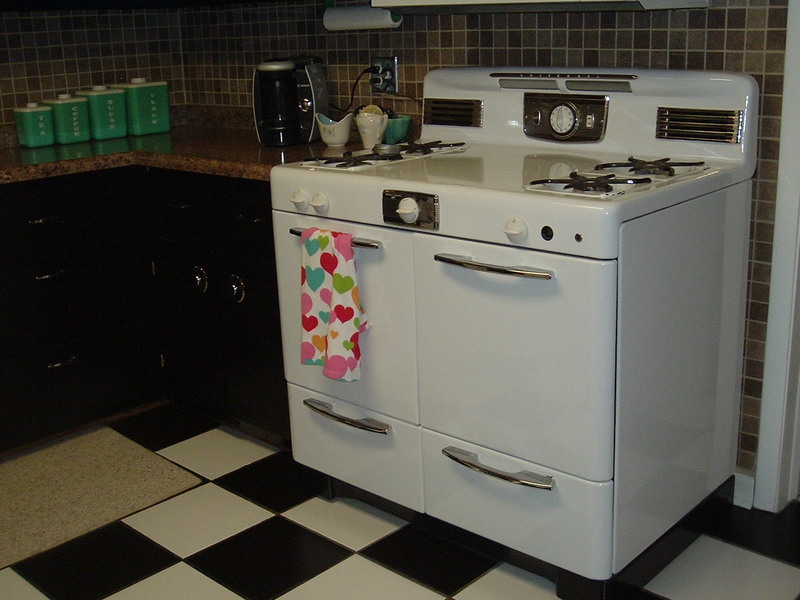 The 1950’s 40″ stove came with us from the farmhouse. It is white with black and chrome trim and fits the space perfectly. We replaced the builders grade double sink with a single stainless one big enough to wash even the largest cookie sheets. It is not my forever sink but will do until I get the drainboard model that I want. 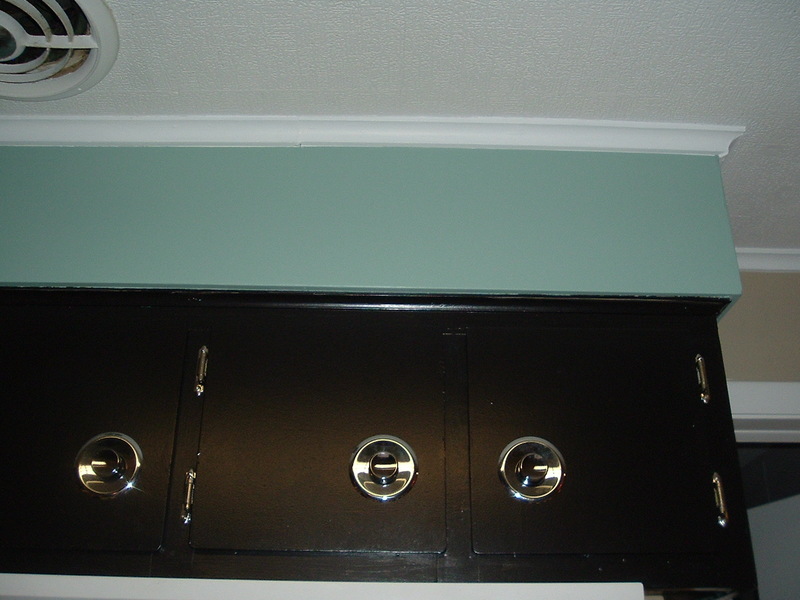 We used leftover aqua paint for the soffit (to match my new color scheme). I hit thrift stores and garage sales and picked up aqua canisters, pottery, Pyrex, tablecloths, curtains and other kitchy finds. I nabbed a brand new (still packed in the box) set of Salem North Star dishes (gasp) at a garage sale for $5! I found 8 more place settings at a local resale shop for $10. They have the perfect “atomic” look I am aiming for. An old tablecloth hung on a tension rod hides the dishwasher hole. 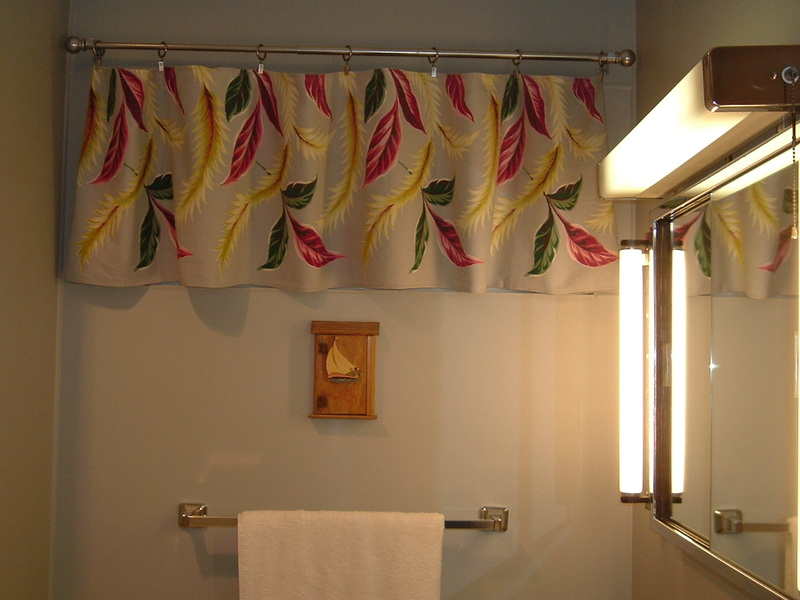 Vintage pinch pleat curtains hang on the window above the sink. 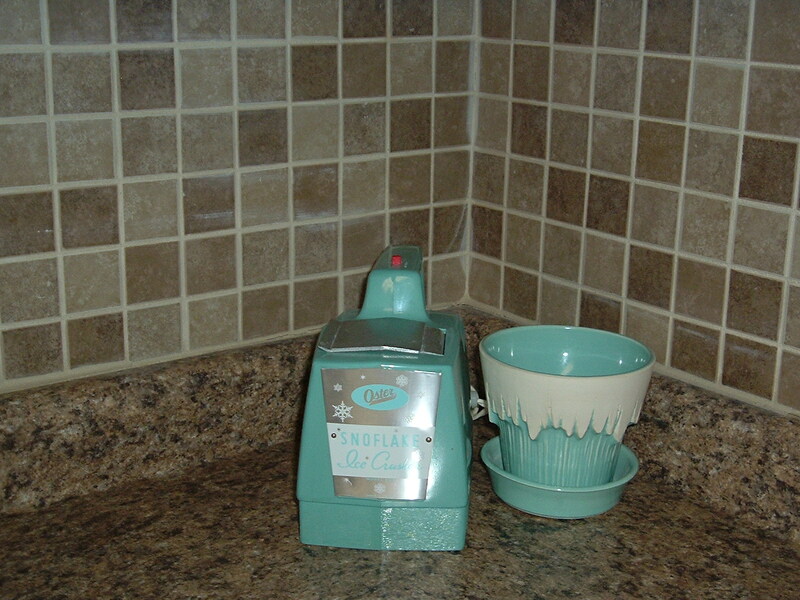 Target has a new line of aqua kitchen items. I purchased the metal bread box, utensils, towels, cutting boards and baking supplies with a Christmas gift card. 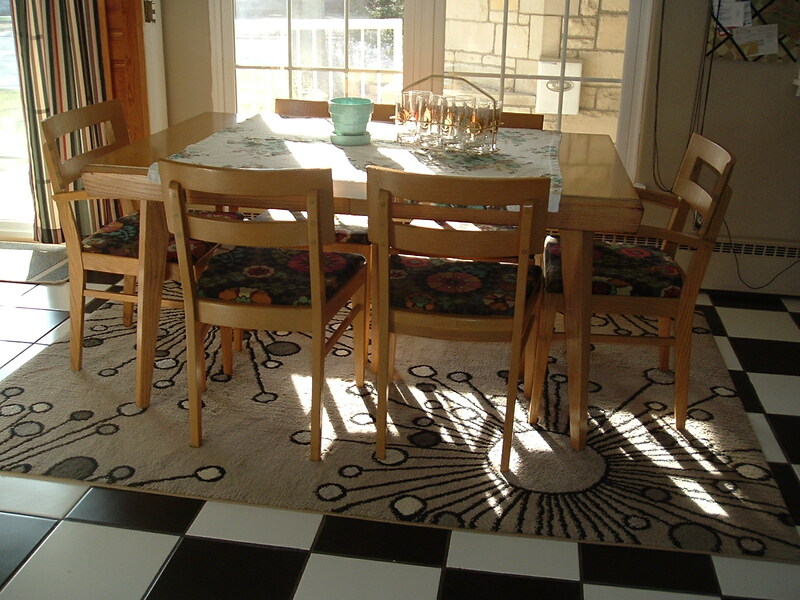 Our new table, chairs, china cabinet and buffet came from Ebay. It is a 1950’s blond set that was a steal for $320. That included delivery! 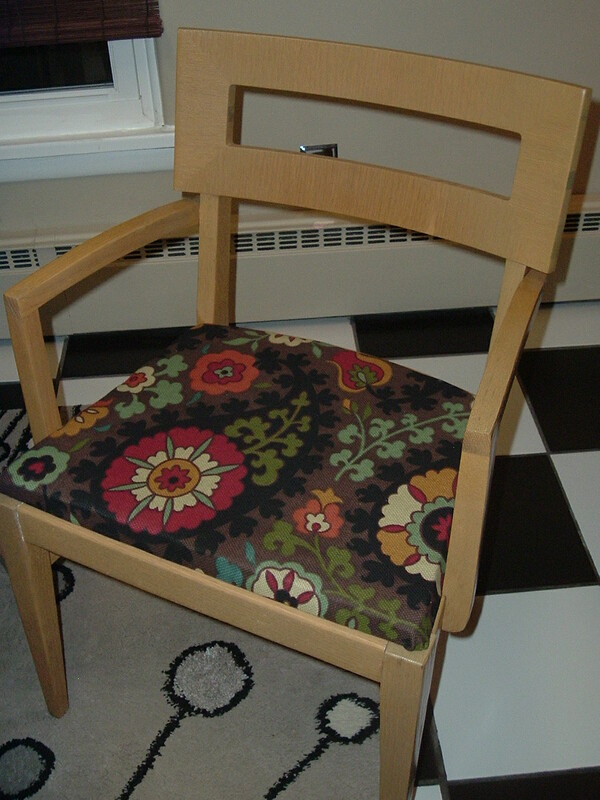 I recovered the seats with fabric I purchased from Hobby Lobby for less than $40. I found a large black and taupe starburst rug for under the table at Walmart. com. 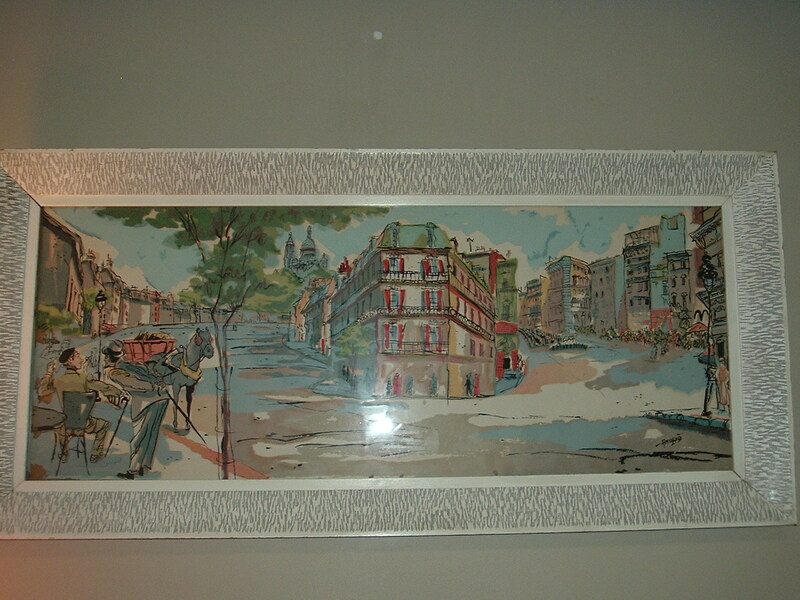 The large mid century Paris print above the buffet was a junk shop find for $2! The colors are perfect for the room. Is this what we planned? Do I like a bathroom door next to the stove? Do I even want a cold ceramic tile floor? No. Am I complaining? Well maybe a little. But this is not forever. I dream of white cabinets large enough to hold a cereal box AND a bottle of olive oil, cork or linoleum flooring, retro countertops with metal edging, pinch pleat or cafe curtains and funky light fixtures. What does a mid century yard look like? I am not a big fan of throwing away anything that is useful; I guess I was a “recycler” before it was cool. My yard changed all that. We moved here just before Christmas in 2010, with a foot of snow on the ground and still coming down on moving day. I really did not know what was growing under all that blanket of white, except a few evergreen trees, some weeping Japanese maples and some roses. Then came spring. 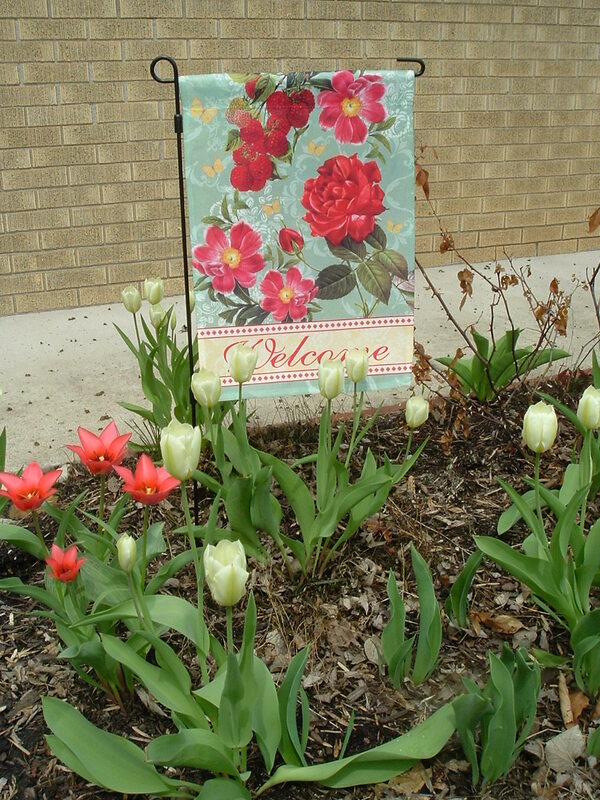 I was welcomed by lots of lovely white and coral tulips along the front sidewalk. The neighbors said that they had been planted by the original owners many years ago. Those had to stay. As spring came and went though, I came to realize that this yard had been stuffed with every kind of flower, bush and bulb ever grown in our zone. You name it, it was growing here and in every color of the rainbow. There had obviously been no plan; just plants plucked down in any available space. Most of the perennials and bulbs were growing BEHIND the 5 foot rose bushes. And all of it was planted under the large overhangs (a big feature in mid century ranches) where they got no rain. Hubby and I spent an entire weekend digging up a small pond in the backyard and then making 2 small walkways with the flagstones. Other weekends were spend editing the abundance. We transplanted a few things, but most went into the yard waste container for the trash man. I know, how could I? I had done some research on mid century plantings and landscapes. It was a much simpler look back then; none of this loose “I don’t care” cottage look. The old roses. A few are bushes, one is a rambler and the 2 others I cut back so far I’m not sure what they are. The old white and coral tulips along the walkway. A huge clump of wild orange day lilies. The miniature Japanese maples. I am not sure if they are period, but they do look modern and simple. The 8 Knock Out roses in the front yard. Even though they are newer, they are a beautiful coral pink and go well with the older roses. 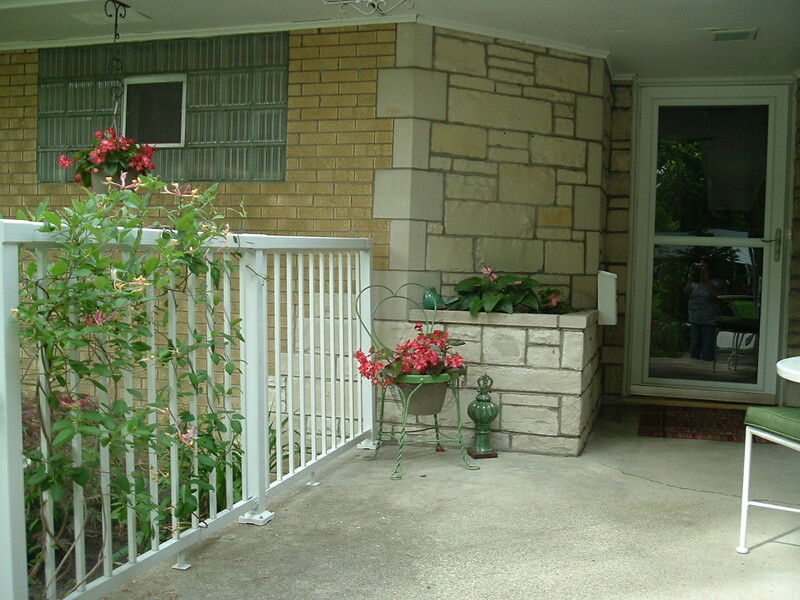 Like many mid century ranches this one has a cool triangular planter built into the front porch. It is mostly shaded so it will have a variety of shade loving annuals or tropicals. 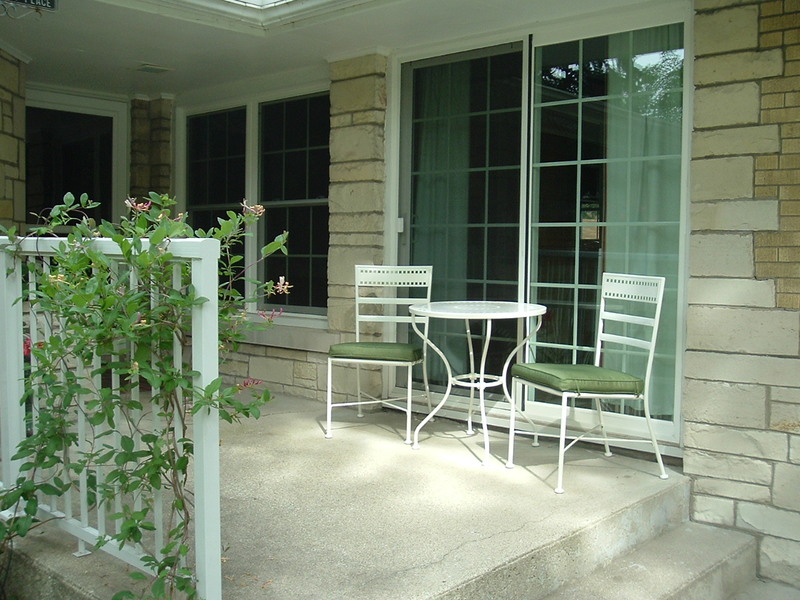 The white railing on the porch was here but is not original. It does not match the style of the house and will go. We want something that looks like a room divider or screen. 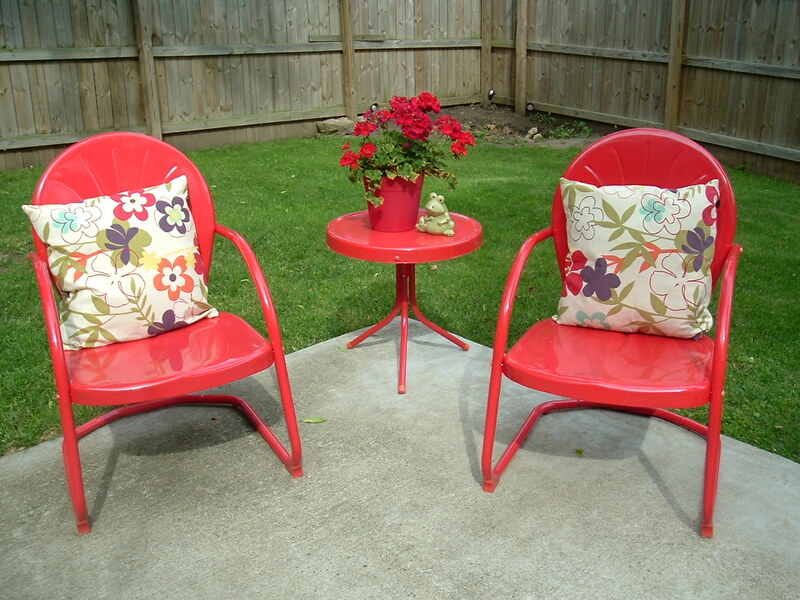 The outdoor furniture has a retro feel. The lipstick red set was from Big Lots and the white set was marked down 75% at Walmart at the end of the season. The pillows are garage sale finds. I will not waste lots of money on annuals anymore. What I will do are pots of red geraniums. I keep seeing them in old ads from the 50’s. And I did bring back hollyhock seeds from France. Despite no rain and record heat all summer, they did bloom.